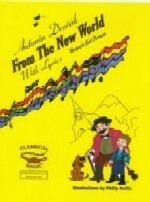 Antonin Dvorák From the New World with Lyrics is an 80 page, fully illustrated, hardcover book with CD. This book and CD have lyrics for each of the 12 main themes in Dvorák's From the New World Symphony. A little song to sing. Ha, ha ha ha ha ha ha ha ha ha..."
and How I Love The Woods. The book tells the story of Dvorák’s life in both prose and lyrics, and includes reproducibles plus a listening guide for the orchestrated recording on the CD. 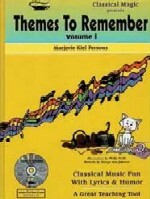 The CD contains, in addition to tracks of the themes with and without lyrics, a fully orchestrated recording of the Symphony (without lyrics).